Well for a few days I'm at home and this awesome 256Kbps (upto 2 Mbps) line was introduced to me. I even downloaded some "stuff" via Torrents, FTP. Awesome download speed (Whole 700Mb in 50mins. That's news!)!! And of course, there always is this strong urge to fix things! Atheros, RALink, Intel, ShirPeak... but nothing worked. I gave up (anyway.. almost all of my time Ubuntu is the sole OS I use, so that didn't bother me much). Here at the starting the 'pppoeconf' [see the section below] wasn't working right. So had to switch on my Windows for a go. You know what...!!! I even forgot the password..!! [had to resort to FingerPrint Access :P Cool! Futuristic!].. anyway.. I changed it from the Administrator Account later. DriverMax: Sucked Bigtime.. MaxTime. It wanted to force me to make an account before even using it and connect online. Bloody... I wanted a wifi driver :P You know, this has been a major paradox... "To Connect to the Internet you need to download a package from the Internet itself" [Linux users.. ever heard of ndiswrapper?]. It got uninstalled in seconds. I copy pasted the entire string in Google and on that page (it wasn't in EN btw) there were some links I sporadically clicked and reached a page which said its "Intel WiFi Link 1000 Driver 12.5.0.57 REV:A". Bingo! DriverRobot: in the mean time I was working on this thing [Multi-Processing you know]. DriverRobot is FREE etc and after the full analysis wanted to go Online to show the possible updates available for the entire computer, but the best part: it allowed me to save the probe as an HTML page and when I opened it under a working Internet connection, it gave me the same Driver Name, Wireless_LAN_Intel_12.5.0.57 [192.4Mb download]. 192.4Mb... Oh! Come on. I searched and downloaded the HP driver sp44954.exe (3.5Mb). Rest is all a cakewalk. PPPoE id/password and you are thru. Connecting from Ubuntu Via Wireless Ubuntu saves me of the trouble to download and install Driver. Wouldn't it be amazing if all the drivers come bundled along with the OS itself. Linux totally nails it... in this regard (ting). Well just now I managed to configure Internet thru BSNL-Broadband in my Ubuntu as well. Connect to the access point, you get an IP-address using DHCP. Now you need to use the 'pppoeconf' program. and it shows you a nice decent GUI. Go thru all the recommended settings and its done. And starts the connection instantly. Just make sure you Press "NO" on this page. You can check the IP etc using 'ifconfig'. and you see iNet addr, and P-t-P. All's good. 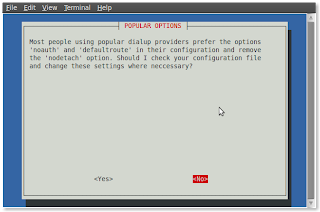 Later you can use 'pon dsl-provider' and 'poff' to toggle PPPoE status. Well the best part that now I can resume the downloads in Vuze. Press ALT+F2 >> Enter 'gksu gedit' >> open the file (interfaces) now and make changes. Connect to the preferred accesspoint (after probably a restart) and 'pppoeconf' again. But its not worth it. * or.... you can yourself make a shell script to make that happen. sudo iwconfig wlan0 essid "ncryption"
:) instead of "ncryption", enter your essid (with/without the quotes). kya likha hai... itna torchr ni karte readrs [if thr r sm] ka..lolz!! Anyways, itz good to read about all your tinkering with 'stuff'....time well spent! You know i've been having Ubuntu problems...probably i can sit down with yr blogs..and try to do something about it 2day!